Today's anti-nuclear movement began as the anti-atomic weapons movement in the late 1950s. At this time, DNA repair mechanisms were unknown and there was only one known cause of cancer ... radiation. Then, during the next half century, DNA repair mechanisms of immense power were discovered along with many more causes of cancer. We now know radiation is a minor player compared to cigarettes, alcohol, red meat, processed meat and obesity; to name a few. We now know why Japanese people moving permanently from Tokyo to either Paris, New York or Sydney would experience a much bigger rise in cancer risk than if they moved into the area currently evacuated around the Fukushima reactors. 5.0 out of 5 starsNukes, climate change and poverty. Geoff Russell's first book 'Perfidy' blew the whistle on the central cancer causing agent underpinning the CSIRO's 'Total Well Being Diet'...red meat. 'Greenjacked' does a similar job on the Green movement's irrational and ill-informed fear campaign aimed at nuclear power. 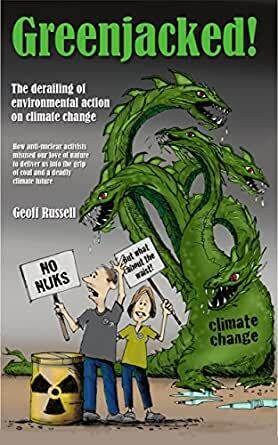 Read this book and you will learn that nuclear power is the clean, safe way of ending our dependency on fossil fuels and bringing life giving electricity to hundreds of millions of the world's poorest people. It is exhaustively researched and highly readable. Required reading for all; consrned with climate change and the environment . A very worthwhile book, as a reformed anti-nuke campaigner I found some very useful information presented in a very readable manner. However I wish Geoff would leave the "If only India had electricity from nuclear power kids would not have to suffer from cooking smoke". Wood and cow dung is free, you have to pay for electricity. If you have money in India you cook with gas. Excellent and essential reading for all those who are concerned about our environment as related to climate change, and how to best preserve it for future generations. A big thank you to Geoff Russell for researching and writing it - congratulations, Geoff! 5.0 out of 5 starsWhat are you afraid of? If you ticked all of the above, here's a question: which ones have you actually experienced? (Personal aside: I've had a pretty close acquaintance with all four and survived them all). Radiation? Well you're getting some from your surroundings and the screen you are reading. Radiation saved me from a cancer that would have killed me, so I'm very glad I had a massive well targeted dose and some radioactive injections to scan for other tumours. Mostly we are afraid of what we have least experience of, and for many people that means nuclear power and the dreaded fear of accidents which may release radioactive materials. But where do these fears come from? You can't 'see' this stuff, we're not familiar with it, so where does the fear come from? Geoff Russel explains how the anti-nuclear war movement morphed into the anti-nuclear movement as if they were somehow the same thing. And guess what? They aren't, they just have a word in common: 'nuclear'. And for most of us, that's where our understanding starts and finishes, but should we just accept that nuclear reactors are dangerous without looking at the evidence? A nuclear reactor is not, and never can be a nuclear bomb, that's the first thing to understand, but there's an even more important fact to grasp: bombs kill a lot of people, but radiation very, very few. In fact as Geoff points out, the people who survived the atomic bombs in Japan (and very large doses of radiation by normal standards), did not develop cancers at an enormously high rate. Radiation did not cause my cancer (most probably HPV did). Chemicals and viruses are way better at producing cancers, and radiation is a very weak agent. This is not what we are led to believe by the hype and hysteria whenever there is a nuclear accident. Most of us can mention three names: Chernobyl, Three Mile Island and Fukushima. But the last two of these killed no one, and the WHO recently assessed the radiation around Fukushima to be so low that no one will ever likely die as a result. All of the above, and much more I've learned from reading Geoff Russell's work, and am very grateful that someone so expert in this field has made it so accessible and readable for non-experts like me. So what am I really afraid of? I am truly afraid of what climate change will bring, to me and particularly to my children. The more I read about the scale of this problem and our need to rapidly cut carbon dioxide emissions the more fearful I am that we are running out of time. Will some solar and wind solve this alone? Simple answer: no chance. We need to do some seriously heavy lifting to replace coal and gas from our electricity generation, and the one technology that does that on scale, and now, is nuclear. Geoff's book lays out, in plain language, what our risks are, and what options we have to meet them. It answers the fears by explaining what we do actually know from the very extensive evidence. Read this book and find out for yourself. This is a short, cheap and highly readable book which delivers the most important message that the world needs today. Russell makes the case directly, clearly and accurately in a way that even the most non-technical reader should understand. The Earth and human civilisation are in mortal danger from climate change yet, thanks to decades of misleading information and uninformed dogma, we are only pretending to do much about it. Too many people fail to appreciate the risks and the quantities of energy production involved and are deluded by ineffectual pseudo-solutions which only make the problem worse. Please read this book and get others to do so! 5.0 out of 5 starsGreenjacked rocks! This book exposes the often ignorant, devious, biased work of many devoted "greens" who began with integrity of purpose, but have refused to change their minds despite massive evidence that SOME of the choices they have made - like promoting inefficient, carbon-dependent, bird and bat killing windmills - are DAMAGING the environment they claim to revere. Absolutely brilliant! A clear and concise review of the key topics, that doesn't require a physics degree to understand. If you are anti-nuclear energy, please challenge yourself to read this book and like me, you may begin to question everything you thought you knew. Essential reading for anyone that cares about climate change. The content gets a solid 5 stars. The arguments also get a solid five stars. The simple explainations and analogies were great and I will borrow them when talking to friends. The only criticism I have is the the book sometimes felt disorganized.